Children | Farias Family Law, P.C. There are two types. Legal custody determines which parent makes the major decisions for a child: health care, schooling, religion, etc. It’s generally shared between the parents unless there’s a significant issue with one of the parents or there’s a complete breakdown in communication that would negatively impact the child. Physical custody goes to the parent with whom the child lives. There may be sole or shared custody depending on the circumstances. The non-custodial parent generally pays child support to the custodial parent based on the MA Child Support Guidelines, which uses a formula that mainly considers the gross incomes of the parties and allows for certain deductions such as health/dental insurance, work-related child care costs, and other support orders. Can a parent take a child out of state without consent? Generally, a parent cannot permanently remove a child from the home state without either a court order or consent of the other parent. Cases in which a parent wants to permanently move out of state with the children are called “removal” cases, and there is a specific analysis used by the court to address the issue. When to introduce kids to new partner? A parent should wait until some time has passed after separation from the other parent before introducing the children to another partner. There’s no exact amount of time that parties are required to wait. It depends on the specific facts and circumstances of the particular case. However, generally, judges expect parents to avoid confusing children by introducing them to other partners so soon after separation. What happens if someone refuses to sign divorce papers? If someone refuses to sign divorce papers, the case continues until it eventually becomes time for the court to issue an order or a judgement. No one is forced to sign a divorce agreement. However, absent an agreement, the judge after considering evidence on the contested issues, will decide the issues. 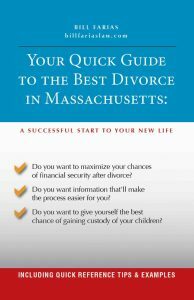 How long does it take to get a divorce finalized in MA? There’s a range of anywhere from a few weeks to a couple of years depending on whether the divorce is contested and the complexity of the issues. An uncontested divorce is processed relatively quickly because there are no contested issues, so the case consists only of filing the necessary documents and having the divorce approved a few weeks later by a judge. A contested divorce on the other hand may be resolved within a few weeks if the parties come to an agreement, but it also may take much longer if contested issues require several hearings or a trial. I don't like the provisions in my divorce decree. What can I do? You should have an experienced divorce attorney review your divorce decree and advise you on its modifiability. Some provisions, especially those related to children are modifiable under certain circumstances. However, others, namely property division and sometimes alimony, may not be modifiable. The best way to prepare for court is to quickly gather the information your attorney needs to effectively advocate for you. If you receive a request from your attorney to provide an explanation on an issue in the case, answer some questions, or provide some documents, you should get it done as soon as possible. If you’re waiting until close to the hearing date to respond, you’re leaving your attorney little time to effectively prepare. Most hearings in family court are non-evidentiary, meaning there’s no actual testimony taken by the judge, and the judge makes a decision based on representations of the respective attorneys. For these hearings, providing the information described above is generally sufficient. However, for evidentiary hearings and trials in which your testimony is required, your attorney should discuss with you the questions that will likely be asked and review your responses. Filing first doesn’t necessarily give you an advantage. Some people preach blindly the need to win the “race to the courthouse.” However, different cases require different approaches: sometimes it’s best for you to file first and quickly. But in other cases, it’s in your best interest to wait. The only way to know whether it benefits you to file first is to schedule a consultation with a quality divorce/family law attorney as soon as you suspect that your circumstances may result in court involvement. There are a couple of key things you can do to reduce legal fees. First, you should promptly respond to requests from your attorney. Delay and procrastination on your part may result in increasing the life of the case, which may require more legal work and thus more fees. Also, if you’re not providing necessary information and/or documents in a timely manner, that may result in a contempt being filed by the other party, which may result in your having to pay the other side’s legal fees in addition to your own. Another way you can save on legal fees is to efficiently communicate with your attorney. Face to face meetings and phone calls are sometimes necessary, but if you can condense a 30 minute conversation into an email that will take the attorney 5 minutes to read, that may also substantially reduce your legal fees especially throughout the life of the entire case. Can I switch lawyers in the middle of a case? Yes. However, before you switch lawyers, you should have another attorney conduct a thorough assessment of the case and give you an opinion on the issues. Sometimes, you need a new lawyer. But sometimes, the problem is that you may need to re-examine your goals and expectations. Having an independent attorney look over your case and give you an analysis will help you figure out how to proceed and whether you indeed should seek new counsel. Do I have to go to court for uncontested divorce? It depends. Generally yes, but in some cases, no. In an uncontested divorce, the parties must file their documents in advance and are then scheduled for an uncontested hearing at which they must appear to finalize the divorce. The exception is that either party may request that the court waive their presence for that proceeding. Typically, this happens when one of the parties lives out of state and attending the hearing would cause a hardship. To make the request, the party must file a motion and affidavit with the court requesting permission to not attend the hearing.